The Holland Marsh consists of 2832 ha of reclaimed land in a river valley north of Toronto, Ontario. Named after an early provincial official, this fertile area was drained between 1925 and 1930. John Snor, Canadian Representative of the Netherlands Emigration Foundation, visited the sparsely settled Marsh and proposed the relocation there of recent Dutch immigrants in Ontario. Assisted by grants from the Netherlands, Canada, and Ontario, fifteen Dutch families, many from Friesland and Groningen originally, settled on the Marsh in 1934 and formed the nucleus of the community of Ansnorveldt. Later, Dutch farmers settled throughout the Marsh. 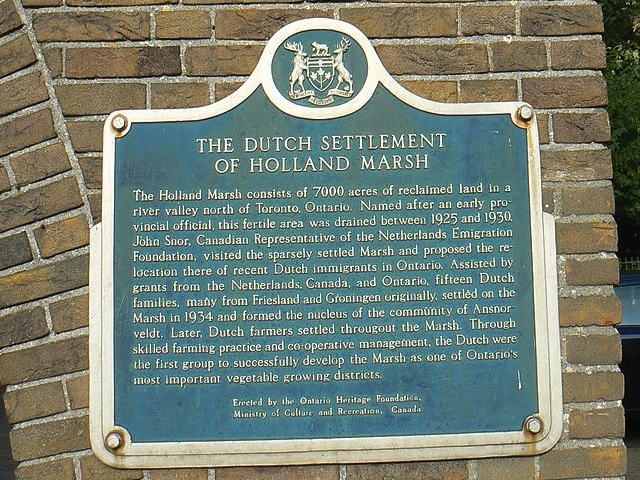 Through skilled farming practice and co-operative management, the Dutch were the first group to successfully develop the Marsh as one of Ontario's most important vegetable growing districts.